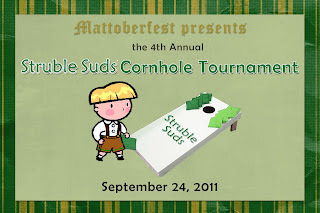 Every year we host Mattoberfest. It is a party that is part my son's birthday party and part celebration of all things "Matt"; hence Mattoberfest. We have lots of food, Octoberfest beer, birthday cake and a corn hole tournament. This year we wanted to make the corn hole tournament a little more. So I asked for some help from Kristin at 2:12 Designs. She created a perfect announcement/design for the event. Look at what she created. We used this adorable design as announcement for the event as well as a special award for the winner. We took the design, had it professionally printed and framed. It was signed by all the "Matts" who attended Mattoberfest (there were a lot). The winner of the corn hole tournament got the framed, signed picture as part of the prize. 2:12 Designs can create custom announcements, invitations, and scrapbook designs. You can browse her current designs for inspiration or she can help you create an item just for you. The great part about 2:12 Designs is that you can print the finished product at any photo retailer. It's a great way to take advantage of all the photo deals that are always around. I would definitely use Kristin from 2:12 Designs again. I think the Struble Suds Chili Cook-off just might be my next event. I love the design, so cute, did you make it? Haha, that little illustration with the blond hair is cute! What a cute idea! Love the design.